The legal profession is one that will challenge and enliven the future professional. A lawyer is a professional who has strong oral and written communication skills. Throughout their education and experiences, they have developed excellent analytical and logical thinking skills. Using these skills, a lawyer helps clients navigate a range of legal issues. A student who studies law may find himself or herself working in many different capacities. Some lawyers choose to pursue careers in government, health, or non-profit environments; others use their legal background in politics or business. There are many avenues for the future lawyer to pursue. Bachelor's degree- Required for admission to law school. Consider taking courses that will give you a broad base of knowledge; that challenges you to develop excellent written and oral communication skills and logical reasoning skills. Upper level courses that require extensive reading, writing, and analysis of texts are great preparation for law school. Competitive academic record- Law school admissions committees look at GPA, the level of difficulty of courses taken, and how many classes are taken Pass/No Pass. You should avoid a series of withdrawals or pass/no pass courses. Major in anything- Because law is such a broad field, any UNL major is a great option. Law school education is comprised of three years of rigorous coursework leading to a J.D. (Juris Doctorate) degree. The total number of credit hours may vary from school to school. The first year curriculum covers foundational topics including constitutional law, torts, legal procedure, contracts, criminal law, and legal writing; years two and three include electives in more specific types of law (e.g., space law, intellectual property, tax law, or international law). Most law schools also offer joint degree programs (e.g., MBA/JD). Practical experience is important so most law schools will have clinics where students have their own caseload of clients under the supervision of a professor. The Law School Admission Test (LSAT) is given four times a year: June, October, December and February. Most students take the LSAT in June (recommended), October, or December of their final undergraduate year so that they can meet application deadlines for law schools. The LSAT measures logical reasoning, analytical reasoning, reading comprehension, and writing ability. Students are encouraged to take as many practice tests as possible. There are many study guides and books available to help you with this process. Much more information on the LSAT can be found on the LSAC website. Sign up for an on-campus practice LSAT exam. 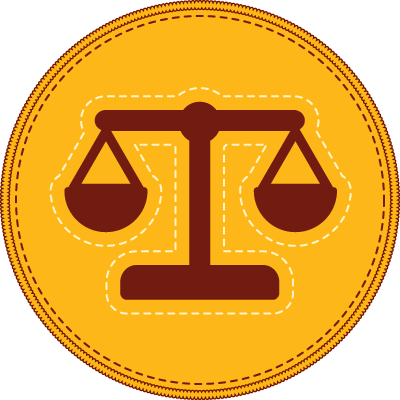 The Credential Assembly Service (CAS) is a standardized reporting service that prepares a report of your credentials for distribution to law schools. CAS will compile LSAT score(s), undergraduate transcripts, and letters of recommendation and submit application information to law schools. Most law school application deadlines are between February and April. However, since most law schools use rolling admission, it is best to apply earlier than the deadline. There are 186 American Bar Association (ABA) Law Schools in the United States, with two in the state of Nebraska: University of Nebraska College of Law and Creighton University School of Law. To find out more about specific law schools, visit the LSAC's searchable law schoool database. Explore this career by shadowing a lawyer and by utilizing any of the following resources.